This powder-coated fire-safe steel ashtray-top receptacle features clean lines and simple design. The exceptional durability of the smooth powder-coated finish provides a low maintenance solution for prominent areas. The base is protected with a non-corrosive ring to avoid scratches on floor surfaces. 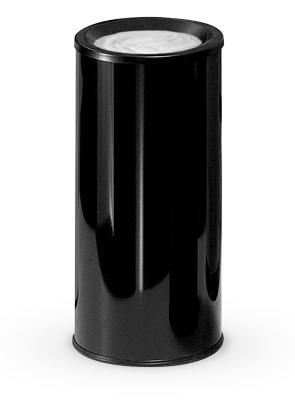 Removable black anodized aluminum sand urn top with a mar proof epoxy finish resists cigarette burns and allows for easy emptying. White or black sand for cigarette urn sold separately.